I love Edinburgh at any time of the year but more and more lately we’re visiting in winter and it’s really a pretty great time to visit then actually. The thing that trips people up when coming to Scotland in the winter time is what to pack. Do you need to be ready for ski conditions or just constant downpours? How cold is it going too be really? 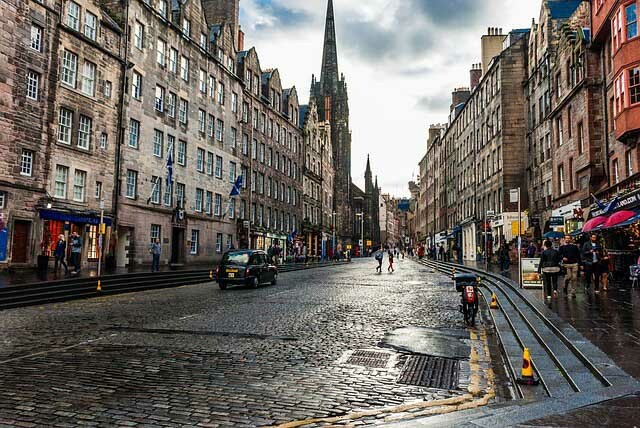 1 Is Edinburgh worth visiting in winter? 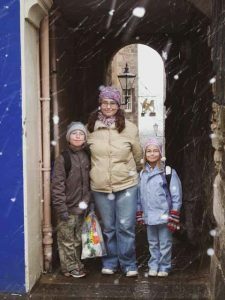 2 Edinburgh and Scotland in winter – what’s the weather like? 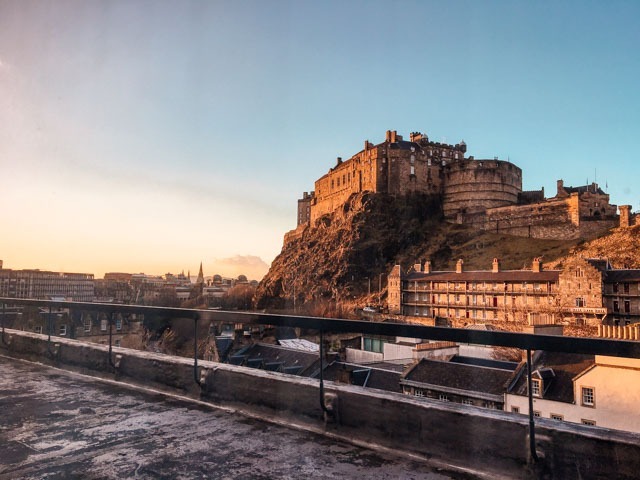 Is Edinburgh worth visiting in winter? I adore Edinburgh so I’m going to say and unequivocal YES! It’s cold, the days are short and it can rain a lot, but there’s so much to do and see. It’s really a great city and going when it’s just slightly quieter is a great idea. 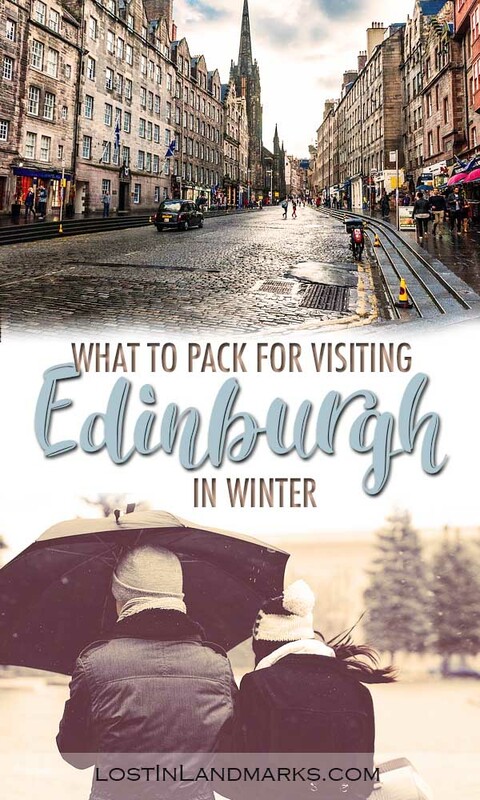 If you’re looking to spend some time in Edinburgh and you’re wondering what to do in the cold weather then take a look at my guide to visiting Edinburgh in winter and hopefully it will answer all your questions. 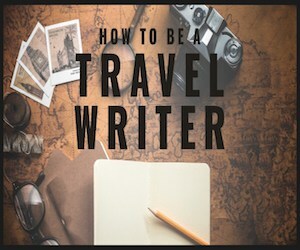 If you have questions about packing and what to take – carry on reading. Edinburgh and Scotland in winter – what’s the weather like? The frustrating thing about Scotland is that it can be so variable in the weather. You can probably guess that you’ll get some rain, some cold and possibly some wind. Will you get sunshine? Possibly. How about snow? Again, possibly. Snow is not unheard of in Edinburgh but it’s certainly not guaranteed. We were once there in early April and had snow but while there in February a few years later had gorgeous sunny (yet cold) days. The best thing to do when planning what to take is to account for all weather types. Ok, maybe don’t bring shorts! Temperatures can go down to freezing, especially on an evening but in the day time can be as high as 10 degrees or so. Sunny days are a blessing but bring with them freezing cold nights whereas cloudy days can be a bit more tolerable once the sun goes down. Depending on how long you’re staying for will dictate what you bring. My advice to you is to check the distance from your transport options to your hotel. If you’re arriving by train and staying in the old town for example, like we did last year, make sure your luggage is able to be carried easily or can deal with the cobbled roads. If you’re planning to get a taxi to the door of your hotel then don’t worry! I adore my packing cubes and they make life so much easier. I did an in depth review of them a few years ago now and I still use the same ones and still love them. Portable scales – oh my, I never knew how much I needed these! If you are someone who likes to buy a lot when on holiday and worry about whether you’ll fit within your luggage allowance on the way back you need some of these. They’re super light and don’t take up much room but they’re really helpful. Especially if you’re bringing back lots of whisky bottles as gifts! As stated before, you really want to be able to cater for all weather possibilities on your winter trip to Edinburgh. With that in mind I really recommend bringing various thin layers that can be worn together to give you all the options. Waterproof clothing, or at least a jacket, is essential. I’m not going to go into specifics on style here but definitely make sure you have at least everything on this list. A rain jacket is essential – don’t forget one no matter what season you decide to come in. If you have enough warm layers to go underneath then don’t feel like you have to get a big thick jacket. Waterproof is just the essential element. A base layer is really important to stop you getting cold right down to your skin on the coldest days and allows a nice thin layer of extra warmth without making you puff up too much. James always brings his and I always forget mine and I’m always annoyed at myself! Warm socks – you’ll thank me for this. Make sure you also have a nice warm pair for in your hotel and you’re just wanting to chill for the evening. If my feet get cold I can never warm up properly! Finally a good hat, gloves and scarf are perfect for keeping the cold away from your face and to stop heating leaving your head and hands. If you’re packing light then at least bring a buff type neck warmer which should fold down nice and small. Wet weather is the norm in Edinburgh no matter what season you visit in. Edinburgh is a fairly safe destination, but it’s very touristy which can bring it’s own issues. You don’t need many gadgets in Edinburgh but you’ll regret if you don’t take a camera to capture all the fun on the royal mile. This is my new camera which I’m loving but am still working out. It’s a mirrorless camera and has the ability to add new lenses and use the manual settings like a DSLR. best bit? It’s super small and looks really cute so easy to take out for a days sight seeing – I never like lugging round a DSLR. An extra battery for your camera is also a great idea because the cold just drains the power right out of them. Having a spare will save any heartache. And along those lines, an external phone battery or power pack is also a great idea. We were given a RavPower extra battery bank for Christmas one year and it’s been a great travel item we always take with us now. Finally a travel plug is worthwhile – I bought one similar last year and it’s been great because I love that it has the USB sockets. We can charge lots just from this one gadget and we have lots of things to charge no matter how light I try to pack! Edinburgh in winter has no midges, no sun so no worries? There’s not a great deal that I think should be brought with you that you probably haven’t already thought of. Scotland has great tasting water and no bug issues to worry about in the winter time (if you come in the summer and plan a trip to the highland and islands you might need to be aware of midges – but winter isn’t a problem). The big issue will be keeping your skin and hair happy in the cold. Moisturizer is one thing I’d definitely pack. Constantly going from the cold air outside to inside attractions, back outside again and then into the warmth of a hotel wreaks havoc on my skin so I always try and bring some. Lip balm is also a great idea to bring along as well for the same reasons. The heating and air in hotels makes my lips become super dry! Obviously a first aid kit is essential but I’d also add in blister prevention. It doesn’t matter how comfy my shoes are, I always do way more walking than I think and blisters are what happens. Many hotels still give away small shampoo and shower gels but it’s seen much less due to concerns over wastage and the environment. As such, bringing your own leakproof containers and filling them with your toiletries at home is a great idea and avoids that annoying moment when you arrive and realise you need to buy more! Winter in Edinburgh can have beautiful clear days but they tend to be very cold too! The theme here is dry and warm, have you noticed? 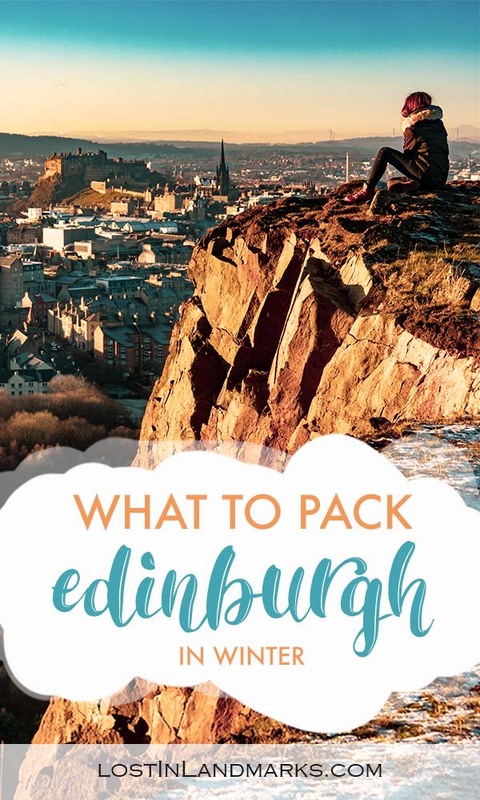 A day pack is essential to keep hold of everything you need as you wander round the city – you’ll want somewhere to add a few snacks (or a lot if you’re me) keep your waterproofs handy and of course not be ginormous. Refillable water bottles are my travel must have, especially as I’m trying to curb my plastic waste. Refill in your hotel before you go out and you’ll be set for the day. As well as water I need warmth! A thermal coffee cup really helps to start the day without getting too cold. Sometimes I take a cup of tea that I’ve made in my hotel and sometimes we’ll head to a coffee shop and I’ll be sure to get a refill there. Either way getting an insulated one means it stays warm and keeps me toasty while wandering around and visiting the sights. Hand warmers are great especially if you suffer from really cold hands – I stick them in my pockets or sometimes in my gloves. You can get disposable ones but I prefer the ones you can reuse. An umbrella is an essential in my view – it allows you to wander and enjoy the city without worrying too much about getting wet. Especially when it’s that fine rain that you don’t realise is soaking you to the bone until it’s too late. waterproof luggage or bag covers are great if you’re walking from public transport to your hotel and you don’t want to risk getting your stuff wet too. 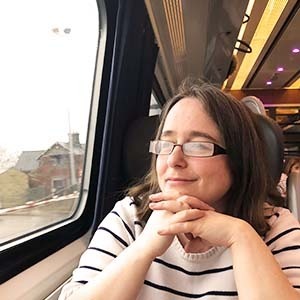 A reusable poncho is also something I like to have in my bag – yes they look pretty awful but they’re a lot better than those disposable ones you can get (and much better for the environment too) and pack down super small. If you’re waiting in a queue or just want to keep your hands free so would rather not have an umbrella this is a great idea. It should also fit over your day pack too so keeps that dry.